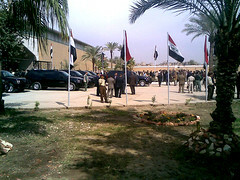 The opening of the Iraqi Museum – check out the set on Flickr. The Iraqi Museum was opened today. I wasn’t invited 😦 so I stood at the fence and took pix. This entry was posted on February 23, 2009 at 9:47 pm and is filed under Uncategorized. You can follow any responses to this entry through the RSS 2.0 feed. You can leave a response, or trackback from your own site. Thank you Salam for visiting the museum and posting the pictures for us. I was hoping that I can be there too. I don’t know if it is now opened for us. Anyway hope that one day we can get inside there. Moi wouldn’t have been invited, either. Your blogs are most interesting. Hey, Salaam. This is good news. I’ve read about the pillaging of the Iraqi Museum, which made me heartsick, as a lot of the museum’s best pieces were ones which I have been reading about since I was a kid. I admit it: I’m an archaeology geek. anyway, this is good news.